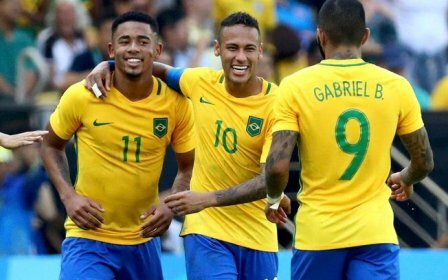 MOSCOW: Brazil eliminated Serbia with a 2-0 victory as the five-time world champions entered the FIFA World Cup pre-quarterfinals by topping the Group E here on Wednesday. Paulinho (36th minute), Thiago Silva (68th minute) gave the South American powerhouse an easy victory which took their points tally to seven after all the three of their games in the group stage. Switzerland finished the Group E in the second spot with five points to book a spot in the second round. Serbia finished third with three points and are eliminated alongside Costa Rica. For Brazil, who had played a 1-1 draw with the Swiss before defeating Costa Rica, the victory over Serbia was soured by a leg injury to Real Madrid left-back Marcelo, who hobbled off the pitch in the opening minutes, reports Xinhua news agency. Although the scoreline might not have shown it, Brazil dominated the match, save for a 10-minute period in the second half when Serbia laid siege to the South American side's goal. The five-time world champions began the game full of energy and nearly went ahead in the fourth minute. Philippe Coutinho laid the ball off to Neymar who split Serbia's defence with a one-touch through pass to Gabriel Jesus. The Manchester City forward's shot was saved but the rebound fell to Coutinho and the midfielder crossed to the onrushing Neymar, who sent his first-time effort wide. Coutinho, Jesus and Neymar caused problems for Serbia's defence, particularly on the left side. The latter two combined superbly just before the half hour mark, but Neymar's curled shot from a tight angle on the left from six yards out was tipped away by Stojkovic. The pair again showed great understanding when the No. 9 ran onto a perfectly weighted through-ball and cut onto his favoured right foot before having his shot blocked. Serbia rarely troubled Brazil's defence. Their best chance came just after the half-hour mark when striker Aleksandar Mitrovic sent a bicycle kick over the bar after Dusan Tadic's cross from the left. Brazil, however, deservingly got ahead when Coutinho spotted a tremendous run from deep by Paulinho and clipped a 25-metre perfect pass through to him. goalkeeper Vladimir Stojkovic came off his line but Paulinho got a touch on the ball before poking the bouncing ball over him and into the net in the 36th minute. The European side emerged from the interval with renewed vigour.A Adem Llajic forced a finger-tip save from Alisson and he parried awkwardly to Mitrovic whose diving header was blocked by Silva. Tadic's delicate chip then sailed narrowly wide of the far post. Serbia had Brazil on the back foot and Sergej Milinkovic-Savic probably should have done better when he fired over with passing options available. Mitrovic then sent a powerful header directly at the goalkeeper. But Brazil stood firm and scored their second goal against the run of play when Silva rose highest after a Neymar corner from the left to head in at the near post.